Cut the top off the Pumpkin and remove the seeds. Cut the Pumpkin into four pieces and place in a baking pan. 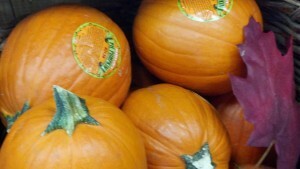 Cover the Pumpkin with aluminum foil and bake in a 350 degree oven for 1 hour or until the Pumpkin is fork tender. While the Pumpkin is baking prepare the Pasta Dough. Combine the Flour with the Nutmeg and then follow the directions on the page for Basic Pasta Dough. Wash and dry the Sage and Parsley. When the Pumpkin has finished baking, remove from the oven and allow to cool. Divide the Dough into 3 portions; keep each portion wrapped until ready to use it. To insure a tight seal, brush water on the areas around the pockets in the sheet. Turn plate over to remove Ravioli and repeat until all the dough is used. Place a second sheet of rolled dough over the first one and with an individual Ravioli Cutter, cut out the Ravioli wherever there is a mound of filling. 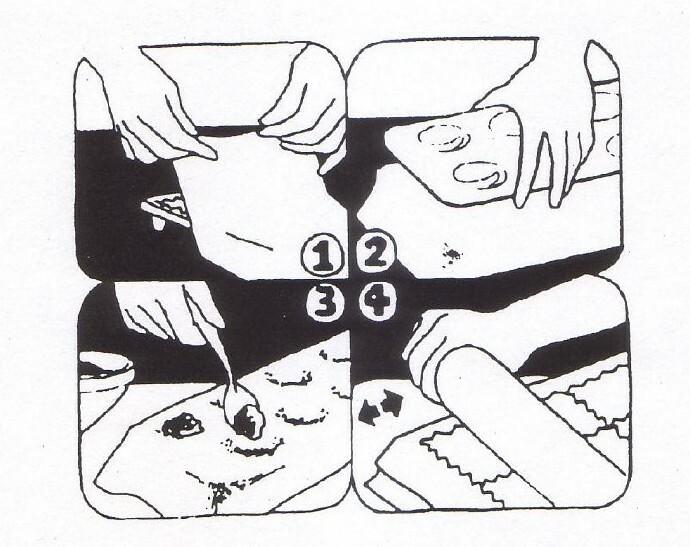 (See Shaping Illustration) Save the scraps to re‑roll, for additional Ravioli. Bring a large pot of Water to a rapid boil; add a Tbsp. Salt and the Ravioli. (Do not cook too many Ravioli at one time ‑ there should be plenty room between each one to allow for rapid cooking). Cook for about 4 minutes or until al dente. 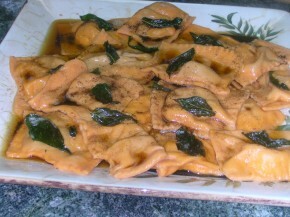 Remove the cooked Ravioli with a sieve, or a slotted spoon and place in the pan with the prepared sauce. When ready to serve place in a large coup de soup (soup plate) and garnish with the remaining sage leaves and roasted pumpkin seeds. Serve immediately. While you are waiting for the Ravioli water to boil, heat a sauce pan over medium-high heat. Add the Pumpkin Seed or Olive Oil and half the Butter. Lower the heat and cook until the Butter starts to Brown. Add the remaining Butter and cook until the Sauce is the desired color. As in direction #2 under cooking the ravioli, add the cooked Ravioli to the Sauce. Garnish and serve immediately with shredded Parmesan on the side.